Want to Teach English in China Next Spring? Do You Know American Sign Language? This recognition comes from the newly released U.S. News & World Report’s “Best Colleges 2014” guidebook. Truman is also ranked 10th overall in the Midwest Regional category among both private and public institutions that provide a full range of undergraduate and master’s programs. Other notable entries for Truman in this year’s rankings include No. 5 in the “A Strong Commitment to Teaching” section, where the University was one of only six schools in the Midwest Region to be listed. Additionally, Truman earned the No. 8 spot in the region in the “Great Schools at Great Prices” section. Of the 15 schools listed, Truman was the only public institution. Truman also shows up in the “A Focus on Student Success” section in the category of “Undergraduate Research/Creative Projects.” Truman’s research program has garnered national recognition over the years since many students are able to participate in research at the undergraduate level as opposed to waiting until graduate school. Inclusion in this section is based on nominations from college presidents, chief academic officers and deans of admissions. The schools with the most nominations were listed alphabetically. U.S. News & World Report bases its regional rankings on peer assessment, graduation and retention rates, graduation rate performance, faculty resources, student selectivity, financial resources and alumni giving. Complete listings are available at www.usnews.com/colleges. For many Truman students, “back to school” comes with a series of inconvenient tasks. Moving in, buying books, signing leases and trekking around campus in the triple digit heat can surely lessen the excitement a new semester bring. However, for sophomore agricultural business major Miranda Biddle these are welcome changes that not only signify the return to classes, but a return to normalcy. To any other person, Biddle seems like an average college student - she enjoys hanging out with her friends, attending class and running cross country and track for Truman, but her friends, professors, teammates and coaches know there is more to her story. Early in 2013 Biddle was diagnosed with Burkitt’s Lymphoma, a cancer of the lymphatic system that affects only around 1,200 people in the United States annually. Biddle was diagnosed after returning from winter break when she noticed that she was having trouble keeping up with her teammates. When she went to doctors she was originally diagnosed with the flu, but Biddle knew that something else was wrong. “I remember thinking, ‘I don’t think that’s right,'” she said. After running x-rays and CAT-scans her cancer was diagnosed. While the news surprised her family, friends and teammates, Biddle felt a sense of relief at finally knowing for certain what was impacting her running. After learning her diagnosis, Biddle’s competitive edge came out as she was determined to show cancer “who’s boss.” She compared her six chemotherapy treatments and 25 rounds of radiation as the hardest running workout of her life. Though the treatments were difficult, Biddle was adamant that she not be treated any differently, especially when it came to schoolwork. Although her treatments required her to return to her home in Aledo, Ill., she remained enrolled and completed her entire class load for the semester. With the help of her professors, she made it work by watching recordings of lectures online and driving back to Kirksville to take tests. 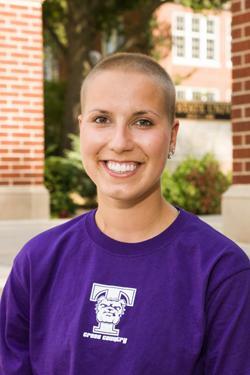 Not only has Biddle, who finished her last treatment Aug. 23, returned to Truman this semester, but she is also preparing to return to training with her teammates. Though less than a month ago she could barely run for five minutes, she is now attending regular practices and hopes to be in shape for competing for the spring track season. Undergoing the treatments for cancer has made Biddle appreciate the small things in life. Her favorite part of finishing treatments is the freedom she has regained; the freedom to go outside or listen to lectures in person, to run, or even be able to simply move around. She is also excited to enjoy food again. Her battle with cancer also helped her become a more compassionate person. Biddle describes the connections she made, with not only other people struggling with cancer, but with those who are helping to fight it, as something she is truly grateful to get out of the situation. Biddle hopes to get involved with organizations such as the American Cancer Society in the near future. For now Biddle is just happy to be back in classes. Though many would consider her luck to be bad, Biddle considers herself blessed. The support she received from everyone she met at Truman, her roommates, teammates, coaches and faculty, helped lift her spirits during the last year and continue to keep her moving forward. Truman’s annual Family Day is scheduled for Sept. 21 and the campus has a variety of activities planned throughout the weekend for students and their families. Following tradition, this year’s events are designed to provide families with information and entertainment from the University and surrounding Kirksville community. Friday, Sept. 20, women and men’s soccer play Lewis University at the Truman soccer field. A Fireside Friday preview will be from 7-8:30 p.m. in the Student Union Building. Saturday, Sept. 21 the day kicks off at 10 a.m. with a Truman Baseball scrimmage. Library tours also run 10 a.m.-noon. At 10:30 a.m. outside of Stokes Stadium, Phi Kappa Tau’s 5K run will support the SeriousFun Children’s Network. More information and registration are available here. The Truman softball team is scrimmaging William Penn University at 11 a.m. The University Art Gallery Faculty Exhibit runs from noon-4:30 p.m. In the Centennial Hall Courtyard from 1-4 p.m. is the Annual Festival Centennial. The Speech and Hearing Clinic is hosting an open house from 2-4 p.m. in the Health Science Building. The Student Activities Board is hosting a free performance of comedian Mike Bliss at 4 p.m. in Baldwin Auditorium. The campus-wide barbeque is from 5-6:30 p.m. on the Student Union Mall (rain site: Student Union Building). Tickets are $8.50 per person, and students with a meal plan eat for free when they bring their Truman ID. Barbeque tickets can be bought here. At 7 p.m. the Bulldog football team plays William Penn University at Stokes Stadium. Sunday, Sept. 22 women and men’s soccer play the University of Wisconsin-Parkside at the Truman soccer field. A full detailed schedule of events is available here. For more information, call 660.785.4016. The Nursing Department received a Nursing Education Incentive Grant for the maximum amount of $150,000. The Education Incentive Grant is awarded to organizations to expand the Accelerated Bachelor of Science in Nursing (ASBN) program. The funds will help meet increased demand, create market-competitive salary and benefit packages needed to attract and retain highly qualified faculty for didactic and clinical teaching, add at least two clinical/instructional adjunct faculty positions to increase the frequency of nursing course offerings, expand clinical sites and partnerships and increase recruitment efforts for prospective ABSN students. This is the second time the Nursing Department has received this grant. Truman was one of seven schools in Missouri to receive an Education Incentive Grant. For more information, visit mdhe.mo.gov/NursingGrantRecipients2013.php. An informational meeting about the Missouri Government Internship will take place at 5 p.m. Sept. 25 in the West Campus Suites Multipurpose Room. Assistant professor of biology Jason Luscier is conducting research on campus and is asking for help from the Truman community. Luscier, along with one graduate student and 14 undergraduate students, is conducting an ongoing research study about window bird strike mortality on the Truman campus. The team is asking for students, faculty and staff to report sightings of a dead or injured bird near a window on campus. The second-leading cause of bird mortality in the U.S. is window strikes, following habitat loss. Birds do not perceive windows the same way that humans do because of the reflections, which can be confusing to them. Consequently, the birds fly into the windows, which depending on the speed and angle, may result in injury or death. College campuses represent areas that have a high concentration of buildings with windows, and Luscier and his research team believe that this may result in higher levels of bird mortality due to window strikes. During the fall migration, the research team hopes to gain insight into this problem on the Truman campus through identification of the number and species of birds injured or killed by windows. To report a dead or injured bird near a window on campus, contact Luscier at jluscier@truman.edu or at 660.785.4612. 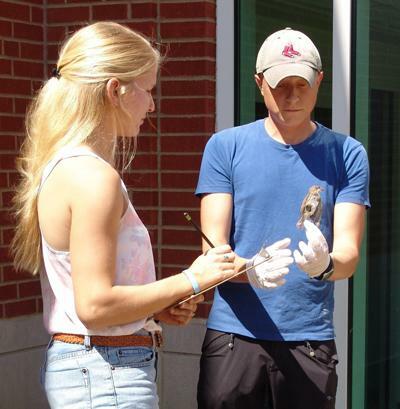 Student Allison Hanna, left, and Jason Luscier survey a bird as part of an ongoing research study. The Student Union Building Reservation Office and Center for Student Involvement will be closed from 1 p.m. Sept. 16 - 8 a.m. Sept. 18 for renovations. After completing a bachelor’s degree and the specified prerequisite courses, admitted students may finish a Bachelor's of Science in Nursing degree in 15 months of study. For additional information, email nursing@truman.edu or call 660.785.4557. The nursing website includes information about the curriculum at nursing.truman.edu. Music will be provided by Truman students. Sponsored by Phi Kappa Tau fraternity, proceeds support the SeriousFun Children's Network, which provides positive, recreational experiences to children with serious illnesses. Register online here. For more information, email jmb1718@truman.edu. Recognized as one of the top entertainers in the country, magician-juggler-comedian Mike Bliss has dazzled audiences with his high-energy performances and unique one-of-a-kind illusions for the past 25 years. He has also been featured on Fox's "30 Seconds to Fame" and NBC's "America's Got Talent." Tickets cost $8.50* and must be purchased in advance. They can be purchased online at store.truman.edu/familyday. Please bring a blanket or lawn chairs as seating will be limited. *If a student has a meal plan, they do NOT have to purchase a meal ticket. Students with a meal plan must bring their Truman ID. Tickets will not be mailed. Tickets may be picked up in the Public Relations Office, McClain Hall 202. Menu: vegan riblets, shredded BBQ chicken, grilled chicken breast sandwich, hamburgers, roasted red potatoes, green beans, potato chips with French onion dip, macaroni salad, fruit salad and zucchini bars with cream cheese icing. General admission tickets are $8 for adults and $5 for senior citizens and those in K-12. Admission is free to Truman students with a Truman ID. Tickets will be available at the ticket windows before the game or can be purchased online at trumanbulldogs.com. For more information, call 660.785.4276. For more information, visit www.kirksvillearts.com/newsite. To find out more about what Kirksville has to offer, visit kirksville.truman.edu/calendars.asp. Phi Kappa Tau fraternity is sponsoring a 5K Run/Walk on Family Day, Sept. 21, at 10:30 a.m. to benefit the SeriousFun Children’s Network. Proceeds from the SeriousFun Phi Tau 5K Run/Walk support the SeriousFun Children’s Network, which provides positive, recreational experiences to children with serious illnesses by sending them to summer camps all across the country. Registration for the race is $15 and includes a t-shirt. Registration is available online here. For more information, email jmb1718@truman.edu. The deadline for applying for SA CHN 550 EFL Internship in China (12 credit hours) is Sept. 30. Through this internship, students teach English conversation in public schools in rural Guangdong Province. Students also take a one credit hour class, ED 549 EFL Methods - China, prior to departure. For more information, contact Timothy Farley tfarley@truman.edu. Sponsored by the School of Health Sciences and Education. The Truman Funds Allotment Council is now accepting new member applications. Applications are due 5 p.m. Sept. 30 on the lower level of the Student Union Building. The Truman Funds Allotment Council is dedicated to the intellectual and social development of students and enhancing their entertainment opportunities. The Council expresses this commitment through the financial support of activities that are organized and sponsored by a variety of organizations that will provide potential benefit to all members of the Student Association and the larger University Community. For more information, contact Yang Li at 660.998.4045 or yl5682@truman.edu. Truman will celebrate Constitution Day Sept. 17. For more information, visit constitutionday.truman.edu. Students and residents who wish to be eligible for a cash award associated with their poster need to register by Oct. 8 and indicate their plans to submit an abstract. The deadline to submit an abstract is Oct. 15. All abstracts must be submitted electronically via email to Charity Thomann at cthomann@atsu.edu. Register online at www.atsu.edu/research/events/5thIBRS.htm. The Office of Citizenship and Community Standards (OCCS) is seeking one motivated student to serve as a student affiliate on the University Conduct Board. The University Conduct Board hears cases of alleged misconduct to determine whether a student or student organization’s behavior violates the Student Conduct Code, and if a violation is found, the imposition of sanctions. The board is comprised of faculty, staff, and student members. The student member will be expected to serve on the board for various hearings each semester as well as participating in various social justice and civic projects on campus. This is a great opportunity for students to serve the university and improve a resume! The application to serve as a Student Member may be found at conduct.truman.edu. Applications are due by 5 p.m. Oct. 14 in the Student Affairs Office, Student Union Building 1110. Starving for tantalizing titles? Then come to the all-you-can-read buffet at the Pickler Memorial Library annual book sale, which will take place Sept. 24-25 in the Student Union Building Alumni Room. You must have your Truman ID to enter. For further information, contact the Library Dean’s office at 660.785.4038. Are you looking for a boost in your exercise routine? Campus Recreation can help. A nationally certified personal trainer will tailor a program to meet your goals while accounting for your health history and exercise preferences. Training sessions are 60 minutes each and may be purchased in a package of 4, 8 or 12 sessions. For more information, including prices, visit recreation.truman.edu/fittepersonaltraining.asp or call Miranda Walton, fitness-wellness director, at 660.785.7739. Ray Miller Elementary School in Kirksville is looking for individuals who are proficient in sign language. Students who are interested in working with elementary students for service and/or scholarship hours are encouraged to contact Becky Pike for more information at 660.785.4688 or bpike@truman.edu. Students interested in making a health behavior change are encouraged to volunteer as a participant for a Health and Wellness Psychology class. For a semester, volunteers will work with students to make goals and plans for a personal health behavior change. To find out more information about the program or to sign up as a volunteer, email Jennifer Hurst at es363@truman.edu. The Robert L. Gould Scholastic Award is an opportunity for students of all majors to submit a research paper on a specific topic for the chance to win up to $10,000. For more information, contact Lana Dowell in the School of Business at ldowell@truman.edu. The Center for Student Involvement is looking for potential Organization Advisors for the 2013-2014 Academic Year. An advisor is a resource for students and will serve as an advocate for an organization. To find out more about advising or submit an interest form, faculty and staff can go to csi.truman.edu/advisors.asp or contact Shelby Sims, program advisor, at ssims@truman.edu. Erin Shaw, academic advisor in the Center for Academic Excellence, has been awarded the Dr. Barbara K. Townsend Memorial Scholarship at the University of Missouri. The scholarship is to be used to support the successful completion of dissertation research. Shaw’s dissertation research on community college transfer student experiences at a four-year university aligned well with the spirit of the award in an area of Townsend’s own research. Shaw began her Ph.D. in Educational Leadership and Policy Analysis in January 2008. Before Townsend's passing in June 2009, Shaw had the opportunity to serve as her advisee. The Prospective Majors Forum in Philosophy and Religion will take place from 4:30-5:50 p.m. Sept. 17 in McClain Hall 209. Jennifer Jesse, chair of the Philosophy and Religion Department, will present, “Bill Blake in Babylon: A Case Study in the Liberal Arts.” For more information, call 660.785.4655. Truman Student Government will have an informational session at 6:30 p.m. Sept. 17 in the Center for Student Involvement Complex. Students interested in student government can pick up election packets until Sept. 17 on the lower floor of the Student Union Building. Elections will take place Sept. 23-25. For more information, contact Brendan Dabbs at bsd4875@truman.edu. Kappa Pi is hosting an origami night 8-9 p.m. Sept. 19 in the Student Union Building Room B. This is a free event open to the public and music will be provided. For more information, contact Stephanie Dunn at smd3865@truman.edu. Study Abroad Fair will take place from 1-5 p.m. Sept. 19 in the Student Union Building Alumni Room. Students will be able to meet with students who have previously studied abroad, as well as faculty and sponsors from partner institutions abroad. Free snacks and refreshments will be provided. Sponsored by the CIEA. For more information, call 660.785.4215. Fireside Friday is from 3:30-5:30 p.m. Sept. 20 in the Student Union Building HUB. Live music and free food will be provided. Federated Garden Clubs of Missouri, Inc., are offering schoolarships for the 2014-2015 academic year. Last year they awarded more than $10,000 in scholarships to Missouri students. Two students selected by the Federated Garden Clubs of Missouri will be submitted to Central Region as an applicant and to National Garden Clubs Inc. as a Missouri applicant, and will compete for a Central Region and National Scholarship. Scholarship application is available on the website at www.gardenclub.org/scholarships. Deadline to apply is March 1, 2014. GetDirectTV.org is offering a $2,500 blogging scholarship to incoming undergraduates at an accredited college or university who write and publish a blog post describing some way television has influenced their post-graduate career aspirations. Interested students can apply at www.getdirecttv.org/tv-scholarship.html. Entries are due no later than 5 p.m. EST on April 30, 2014.